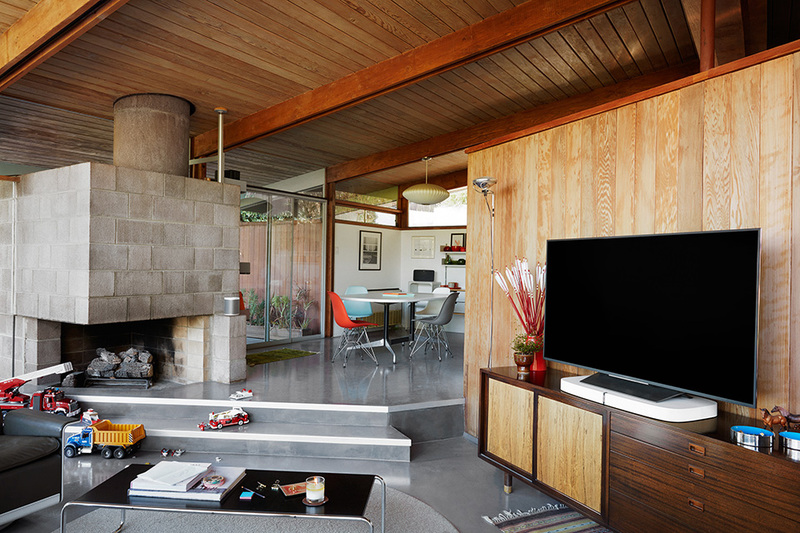 A Sonos wireless home sound system streams directly from network connections to streaming services for uninterrupted sound. There are some people who like to live life with a soundtrack. The right music makes experiences richer and livens up dreary tasks. Music makes life better, and now, Sonos makes music better. Eyehear Technology Group recommends Sonos speakers. People in Montana have come to rely on the recommendations from Eyehear in Kalispell because the company has worked for over a decade to match solutions with the needs of their clients. Eyehear stays up to date on the latest technologies to help guide clients’ choices toward what will work best for them, their homes, and their lifestyles. This includes designing and installing the convenience of smart home technology to manage music, multimedia devices, heating and cooling systems, window shades, elevators, garage doors, security, and surveillance. Eyehear also installs studio-quality home theaters, networking systems, and integrated technologies for video that source entertainment from many different media. Vukonich explains that the Sonos app individually controls the operation of each speaker. The app is loaded to a smartphone or device like an iPad, and the app controls access to a variety of online streaming services like GooglePlay, Pandora, Spotify, and more. “I’m impressed with the ease of control through the app. It’s easy to synchronize rooms to play the same song, or to play something different through some or all of the speakers,” Vukonich adds. He notes that the Sonos app is compatible with the operating systems of desktops and laptop computers, while other brands are not. 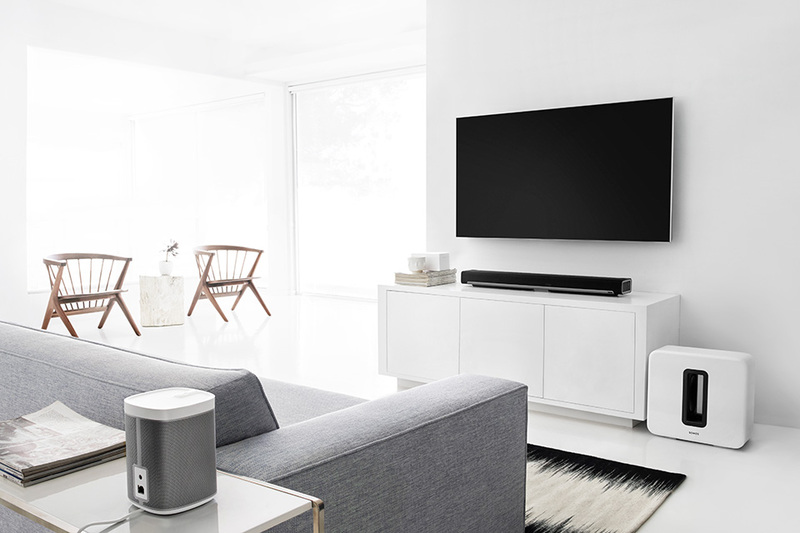 For televisions or home theaters, the Sonos Playbar (or Playbase if the television will rest on top of it) incorporates nine speakers and adds full theater sound for television. Plus, it can also stream music. With the addition of a Sub for deep base tones and two Play 1 speakers, it creates 5.1 Surround Sound. Vukonich finds that if someone doesn’t want Surround Sound, the Playbar and Sub can be sufficient for many clients’ TV rooms. Sonos offers four choices in speakers. The smallest is the Play 1. Vukonich describes, “It has good sound quality for its diminutive size. If a client wants stereo-quality sound in a room, it takes two Play 1 speakers to achieve stereo sound. The Play 1 speakers are also good models for completing the rear of a 5.1 Surround Sound. A Play 1 by itself is usually more than adequate for a bedroom, small office or den, and it can sit on something or be wall–mounted. The next size up is the Play 3, which upgrades to stereo sound in a single unit. The Play 3 is often placed in kitchens because it has the ability of fitting on shelves vertically or wall-mounted. According to Vukonich, placing two Play 3s in a larger room achieves a good quality stereo sound. The Sonos deluxe speaker is the Play 5 model for larger rooms. It has an even higher sound quality including a heavier bass sound. “For truly great sound, you can place two Play 5s in a room, and they will rival much more expensive speaker systems for a lot less money,” notes Vukonich. The true test of Sonos speakers is to see and hear the difference. Vukonich invites you to the Eyehear showroom/design center in Kalispell to compare the different Sonos models and to experience their capabilities and ease of control and operation. Sonos can fill your home, and your life, with music. for more information visit www.eyehear.us.